This is the first "feature special" for Anno 2205, which presumably means they'll release a few more before the game comes out in a couple of weeks, on November 3. For this first one, the focus is on multi-session play and regions. Basically, your game is split up into sessions in different regions. There are twelve sectors, some on earth and some on the moon, which the man in the video says "can be combined into one gigantic, endless game". The nine player sessions are divided into three regions: the Temperate Zone, Arctic Zone, and Lunar Zone. These cover the three basic temperatures: warm, cold, and moon. The Temperate Zone is for big metropolises, the Arctic Zone is for smaller settlements centred around heat-generating factories, and the Lunar Zone requires shield generators and buildings protected from radiation. I confess, I'm not quite sure of the difference between a sector and a session, but apparently there are three sessions in each sector and those which the player doesn't choose will be obtainable later in the game. The other three of the twelve sectors include two crisis zones that feature optional military conflicts, and a space station, which hosts the online features like the council, a place where players can vote. The big thing about sessions is that they run in parallel, and the player can switch between them. So it's basically a world map with different things going on at once, but split up into disparate parts so that it can include places like the arctic and the moon without having to account for all the geography in between. 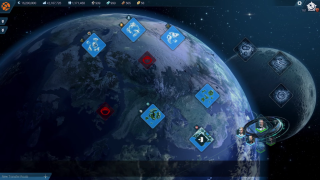 If you're not sure whether Anno 2205 is for you, check out Dan Griliopoulos' hands-on.